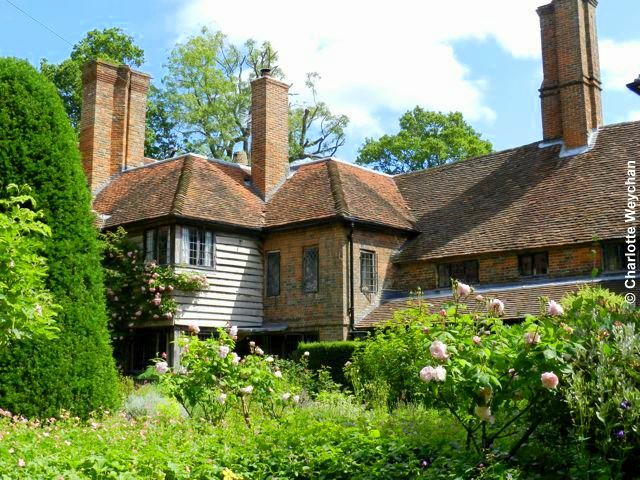 If you can possibly make it to Surrey this spring or summer, you have to visit Vann - home of the Caroe family for more than 100 years - with its delightful, five-acre, Arts & Crafts garden, that incorporates one of the only water gardens ever designed by Gertrude Jekyll. This part of Surrey was Miss Jekyll's home patch and she lived just a couple of miles down the road at Munstead Wood. 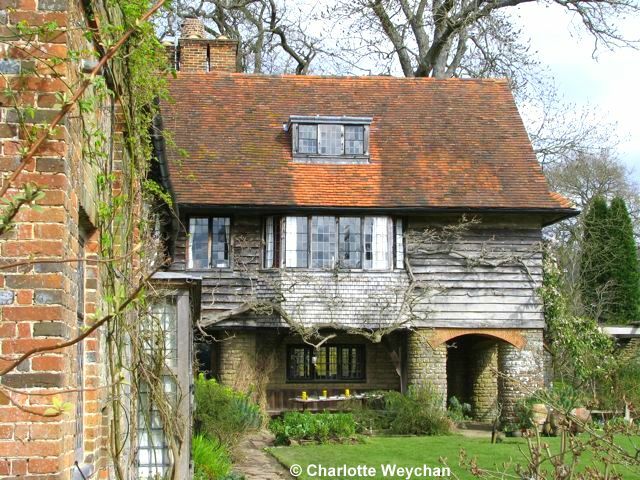 So when William Douglas Caroe, architect and great exponent of the Arts & Crafts movement, purchased the lease of Vann in 1907, he set about extending the house and then approached his friend and neighbour - Miss Jekyll - to enlist her help in redesigning the garden. Vann is filled with colour at this time of year and from the moment you walk through the gate and see and smell the roses ahead of you in the Old Garden at the front of the house, you'll be transported into a wonderful world where plants and landscape blend in perfect harmony. 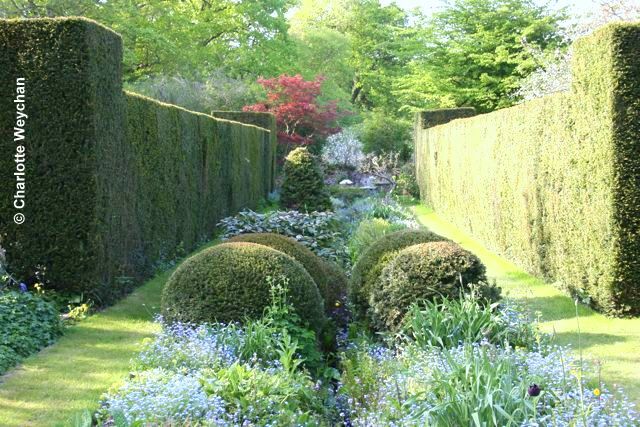 This is the oldest part of the garden, and is enclosed by clipped yew hedges, divided by paths and planted in cottage-garden style. Wander round the side of the house and you see the pergola (right) ahead of you, added by W.D. Caroe, when he extended the house a century ago. 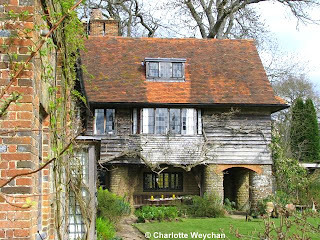 It's built of Bargate stone with oak cross beams and connects the house to the lake at the bottom of the lawn. The pillars are reflected in the design of the house (below). The pergola is underplanted with euphorbias, hellebores, ferns, pulmonaria, hemerocallis, and other shade-lovig plants, but also includes seasonal bulbs, so there's always something in flower here. 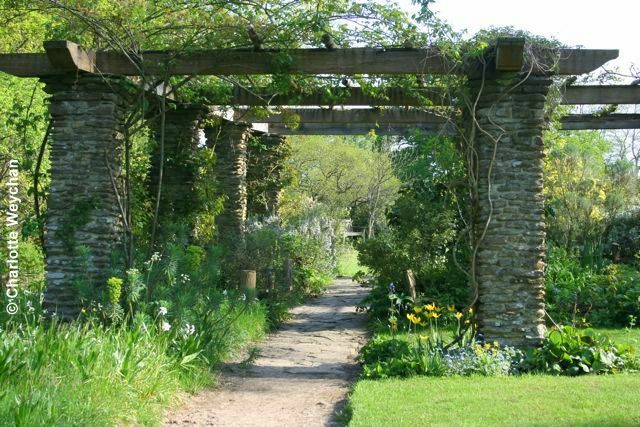 Follow the path through the pergola to the water's edge and then choose your route through the rest of the garden. 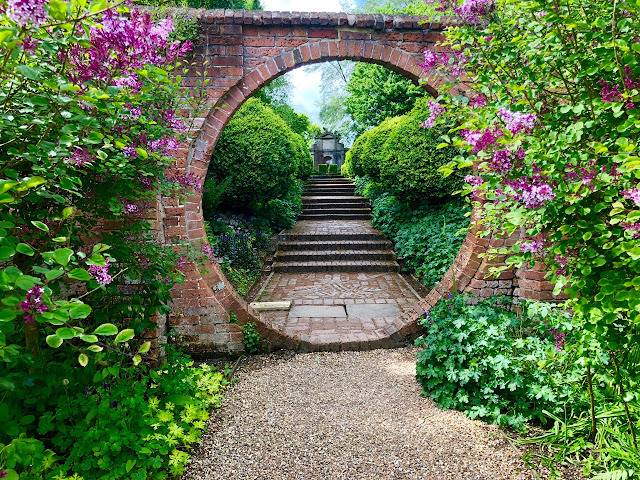 Turn left and head for the vegetable and herb gardens, and the yew walk, or turn right into Jekyll's water garden, which has a winding stream, criss-cross paths, also made of Bargate stone, a series of bridges that cross the stream and a profusion of planting typical of the Arts & Crafts style. Hellebores, hostas, anenomes and ferns abound here in this shady heaven. In winter it's carpeted with snowdrops; and in April/May there are bluebells. In the opposite direction, at the north end of the garden you'll find the yew walk (below) - one of the two formal parts of the garden, with immaculately clipped yew hedges, planted over a century ago in 1909, and now over two and a half metres high. And be sure not to miss the Island Beds and Orchard adjacent to the walk, as well as the vegetable garden, which the Caroe family still use today. 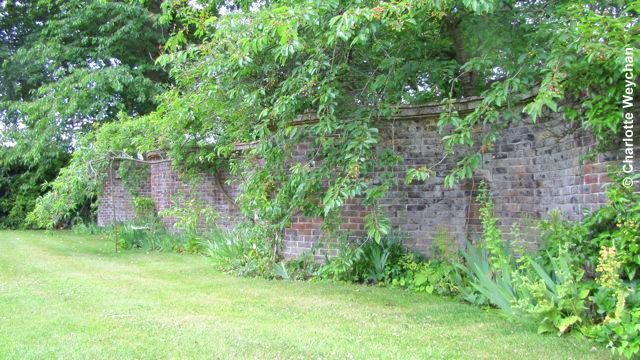 Also worth noting is the "Serpentine" or Crinkle-Crankle wall (below) - a fine example of a curved wall used to shelter fruit. The garden at Vann is tended by the Caroe family, who still live in the house that A.D. Caroe refurbished more than a century ago, with help from a gardener just three days a week. For opening times head to the Vann website, as dates change each year. 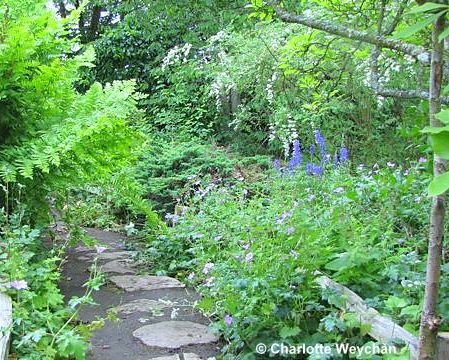 It's also open every Wednesday for the NGS until the end of July 10.00-18.00. Do get there if you can because it's a wonderful garden ... worth making an effort to get to!! Also close enough to Loseley Park to do both in a day, if you're making a special trip. Definitely one for the Wish List! Another wonderful tour! I just love the stone. The yew walk is quite impressive as is the Crinkle-Crankle wall! Fantastic! 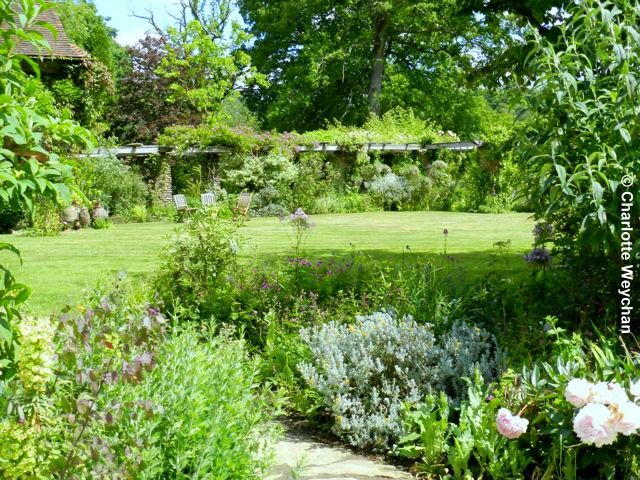 I love old gardens with full planting beds...so lovely, so inviting. Thanks for the tour. absolutelly marvelous! thank you for presenting such beautifull gardens, not to mention about the Jekyll water garden. Thank you! 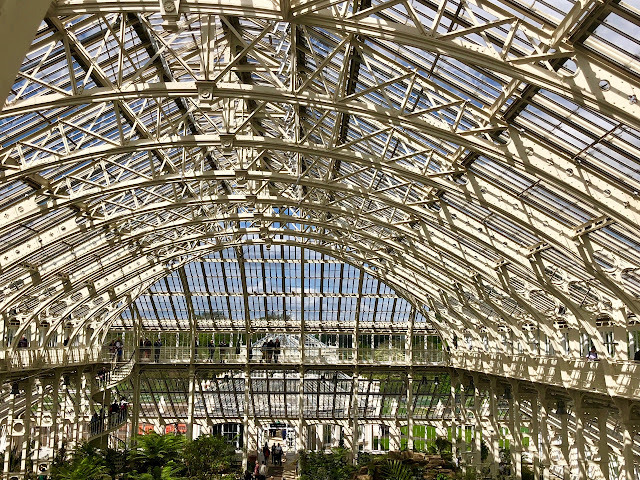 Such a lovely tour..you photographs really capture the beauty of the garden.